Quite an interesting gist and video to watch below…lol. The Dad of a baby Gorilla was presented with 3 names in different food baskets. The basket he eats out of, determines the name of the of baby Gorilla. He was presented with Nyona, Nia and Nneka all African names. 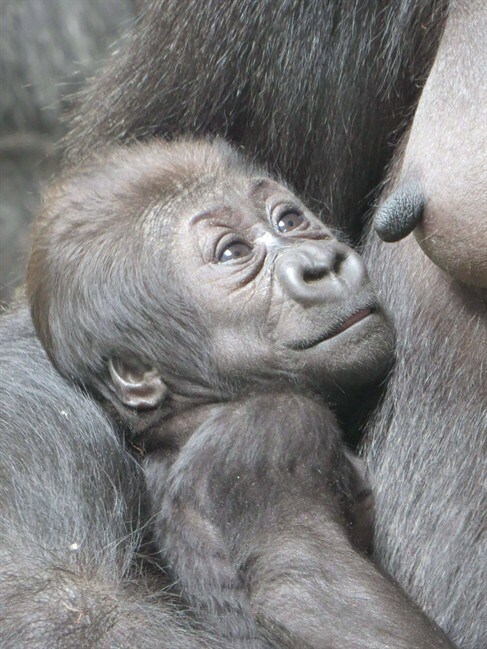 The zoo had asked people to try to come up with names that were African and that started with the letter “N” in keeping with the tradition of naming baby gorillas with the first letter of the mother’s name. The zoo says Charles (Dad), the Western lowland gorilla silver back who mated the female baby born Jan. 10, chose her name out of three possible contenders.Charles was presented with three displays, each showing a potential name along with treats such as fruit, nuts, palm leaves and bamboo. Nia and Nyota rounded out the trio of names drawn from more than 10,000 public submissions and then narrowed down by a panel of judges.